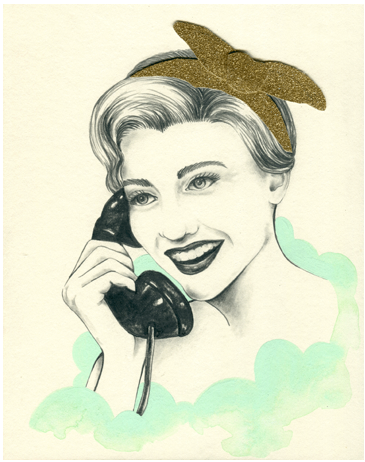 Kelly Cloninger; "You're Invited"; graphite, acryla, gouache, and glitter paper on panel, 8 x 10"
Kelly Cloninger’s work for Girl Party, her upcoming show in whitepec at whitespace gallery, evolved from her own interpretation of feminism versus historical viewpoints. Since the rise of feminism in the 1970s, the movement’s ideas experienced several shifts and changes. When the idea of feminism first appeared, women felt compelled to liberate themselves from the objective demands of man. Bra-less, makeup-less, and high heel-less, women supporting the feminist movement gave up on what society had always considered “feminine.” Women using power tools and wearing suits became new forms of self-empowerment, but only for the sake of making the point that they could live up to the roles of men. Feminism is supposed to be about the support of femininity, so why has it so often revolved around the refusal of it? Rejecting past actions of feminine denial, Cloninger’s body of work focuses on the celebration of all things “girl.” A vast explosion of hot pink and glitter, Girl Party aims to shine light on femininity and simply celebrate it. Let’s party! Kelly Cloninger is an Atlanta-based visual artist who attended Atlanta College of Art and later received her BFA in Painting from the Savannah College of Art and Design. She has shown her work throughout Atlanta, including shows at Beep Beep Gallery, Kibbee Gallery, MINT Gallery, and Swan Coach House. She has also shown her work nationally in venues like the Dallas Museum of Art and participated multiple times in the annual Art Papers auction. Girl Party is Kelly Cloninger’s first show at whitespace gallery. This entry was posted in Uncategorized on April 27, 2012 by Frank.